I have seen this strange contraption in Starbucks shops back in the Philippines: transparent, glass containers with metal support and a sort of plunger attached to a metal rod. I did not know what it was, and kept to the mugs and tumblers instead. 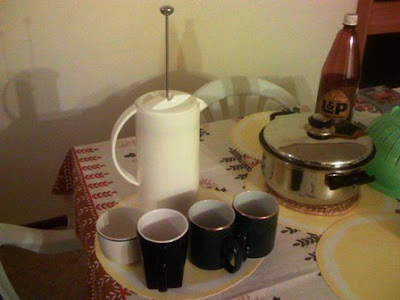 However, the coffee press (also called a French Press) seems to be a standard device in the New Zealand kitchen as a vast majority loves to drink coffee. We still have instant coffee at home as a quick fix, but we have recently bought our very own coffee press and found it really easy to use. Plus, the resulting coffee is (predictably) superior than instant coffee! True, there can be a bit of gunk (ground coffee that managed to get through the filter) at the bottom of the cup - especially the last serving - but I do not mind it. You can, of course, refrain from doing a bottoms-up. We were able to purchase a coffee press that looks like a coffee pot! Neat, huh? 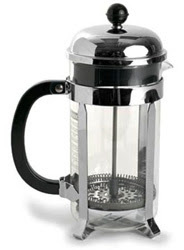 A partner to the coffee press is a coffee grinder. Connoiseurs will highly recommend grinding your own coffee, but if you are reading this post, it is likely that you are just as new to the coffee press as I am and will want to keep it as simple as possible for starters. So for your coffee beans, you can have it ground by your favorite coffee shop and transfer it to an airtight container at home. Make sure the beans are coarse-ground. They usually ask what type of filter you use (for the coffeemaker); advise the barista that it's for the coffee press and they will grind it accordingly. Another way to get your ground coffee is by purchasing from your favorite supermarket. 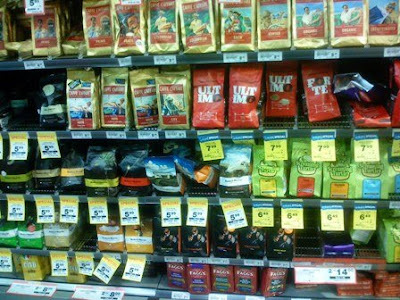 There are lots of ground coffee available in different flavours. Make sure that the label says it's for "plunger", which refers to the coffee press. Now on to using the coffee press. 1. Boil your water. Again, coffee enthusiasts recommend filtered water over tap water as water also affects the taste of the coffee. Tap water will do, of course, in general circumstances. The temperature of the water should be around 195-205°F (90-96°C). A simple way to approximate the temperature is to remove the water from the fire when it boils and let it stay for a minute or so. This is to avoid scalding the coffee. 2. 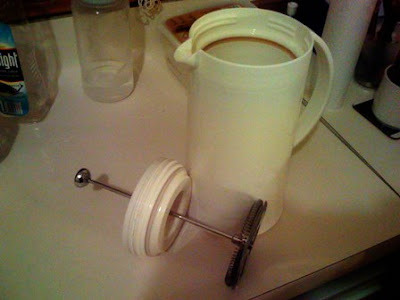 Remove the cover with the plunger mechanism off the coffee press. Place 1 tablespoon of coarsely ground coffee per 7-8 oz of water (which is roughly equivalent to a cup). You can play around with your coffee preference after comparing to this ratio. 3. Slowly pour the boiled water into the coffee press. 4. Give it a good stir. 5-7 stirs will do. If there are coffee bits floating around, the stirring action will sink these. 5. Cover with the plunger/filter pulled up. Let the coffee steep for 2-3 minutes for a small pot, or 4 minutes for a big pot. 6. It's time to push the filter! Hold the cover with one hand, and with the other, slowly push down the metal rod vertically. Make sure it's always vertical, or some coffee grinds will escape and make the coffee mucky. The hot water might also overflow and scald you so push slowly. 7. It's done! Pour into cups while holding the cover (our coffee press has a screw-top lid so it's safer). 8. Remember, the coffee left in the pot will continue to brew so you will be left with a stronger coffee if there is some left over. So either prepare the exact number of cups, or store the leftover in a thermos. I think it's also a very nice way to entertain guests because you go out of your way to prepare good coffee for them. So enjoy your coffee, and enjoy the company! I love using a French press coffee pot - something about the ritual plus the coffee tastes great! Oh and I also like that they are so cheap. That's really interesting that the are so popular in New Zealand. Here in France the rage is for espresso machines but I am quite happy with my little pot. Cheers. Kim: the ritual! Yes! That's what I also had in mind but was not able to include it in my post. It reminded me of the Japanese tea ceremony without the elaborate preparations, the end result of which is also honoring the guest.